Arborio is the classic rice used for making risotto. It's main characteristic is that it can absorb a lot of cooking liquid yet leaving the grains with a good ‘bite’ when fully cooked. In fact, the only trick to any risotto is nailing the right cooking time for rice. 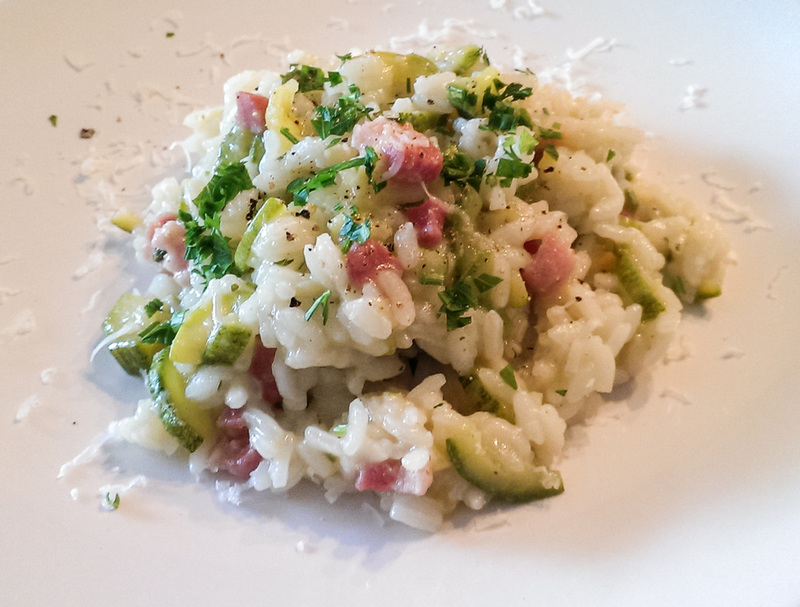 A good risotto should be creamy, rice must be soft on the outside yet firm and solid on the inside. Finely mince the shallot. Cut off each end of the zucchini and cut lengthwise in half. Cut each half in half again ending up with quarters. Line up quarters and slice across zucchini. In a small pot heat up some water and add a half cube of vegetable stock. Once boiling, turn down the heat to minimum so as to keep the stock warm. In a frying pan, heat a tbs of olive oil and add the shallot and the diced bacon. Fry until the shallot softens, then add the zucchini. Season with salt and black pepper and stir fry for 5-10 minutes (or until zucchini are almost cooked). Then add the rice and stir fry together for 1-2 minutes. Add a glass of white wine and simmer stirring until all the wine evaporates. At this point, gradually start introducing vegetable stock, a ladle at a time, stirring and letting the rice absorb all liquid before adding more. Repeat as many times needed, on medium heat, until the rice starts to soften and turn creamy. This should take about 14 minutes, but make sure to taste the rice bits as not to overcook it. The overall texture should be slightly looser than the final result. When the rice is soft on the outside but slightly al dente on the inside, turn off the heat and add a knob of butter and grated parmesan cheese. Stir gently to get an even mass and leave to rest with lid on for a minute or two. Serve with a dash of parsley, a sprinkle of black pepper and an extra bit of grated Parmesan cheese. NB: It is imperative that you serve the risotto immediately. If it stays covered longer than 2 minutes it will overcook and become a mushy mess not very pleasant to eat.